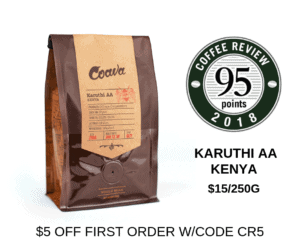 This blend is comprised of four coffees: a washed-processed Guatemala, a honey-processed Honduras, a washed-processed Honduras, and a washed-processed Ethiopia. Kakalove Café is a nano-roaster located in the small city of Chia-Yi in Taiwan that strives to procure and roast the finest quality coffee. Visit www.kakalovecafe.com.tw or email kahiyuho@gmail.com for more information. The Bottom Line: A lush, floral and richly sweet espresso blend, with dark chocolate tones as the throughline.